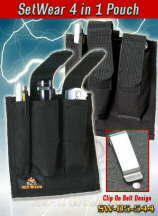 Holds Maglite, Scorpion or Surefire Flashlights. Holds all types of Leathermans, Gerber's etc. Extra side pocket holds Sharpie, pens & pencils. Added custom pocket in the back holds note pads, Palm Pilot, etc. Easy on/off clip design for use with or without a belt. Designed for people on the go. Added feature that allows for clip on or loop through the belt.